Vellaala Subbamma (వెల్లాల సుబ్బమ్మ) (better known as Santhakumari (Telugu: శాంతాకుమారి) ) (17 May 1920 - 16 January 2006) is an Indian musical artist and film actress. Santhakumari is the wife of the famous yesteryear Telugu Director and Producer P. Pullaiah. 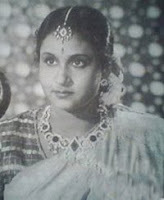 Santhakumari debuted in Telugu Cinema with Mayabazar a.k.a. Sashirekhaa Parinayam (1936) directed by P.V. Dasu (Pinapala Venkata Dasu). She acted as Sashirekha in the movie – the role played by Savitri in the 1957 version of the movie. She acted in Sarangadhara (1937), during which time the director of the movie P. Pullaiah fell in love with her. They married the same year.The couple floated the banner PadmaSree Pictures after their daughter Padma, with Sri Venkateswara Mahatyam (1939) and made great hit movies like Jayabheri (1959), Sri Venkateswara Mahatyam (1960), and Preminchi Choodu (1965). Santhakumari acted in most of the movies that were made by her husband. Her performance in Shavukaru (1950), Ardhangi (1955), Sree Venkateswara Mahatmyam (1960), Shanti Nivasam (1960), Ramudu Bheemudu (1964)are remembered even today.In 1947, the Pullayya-Santhakumari couple started the Ragini Pictures banner along with Bheemavarapu Narasimha Rao (BNR) with Bhakta Jana (Tamil). They made 22 films on both PadmaSree and Ragini banners put together.She played many roles - lead actress and then graduated into supporting roles. She also played a negative role in Gunasundari Katha (1949). She acted in about 250 films, until 1976 when she acted in movies such as Andaru Bagundali, Maa Inti Devatha, and Secretary. Pullaiah and Santhakumari acted as wife and husband in only film called Muttaiduva in 1979. For her contributions to Telugu Cinema, Santha Kumari was awarded the Raghupathi Venkaiah Award in 1998.